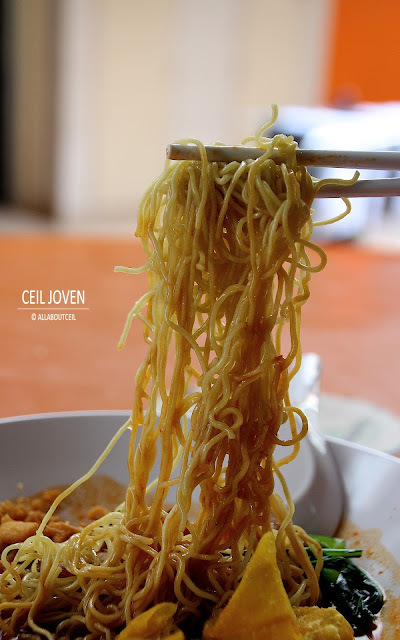 ALL ABOUT CEIL: That Scientifically Cooked Wanton Mee. It is the curiousity that gotten me to pop by here for their wanton mee. This wanton mee is tucked away in a coffee shop at Holland Drive. 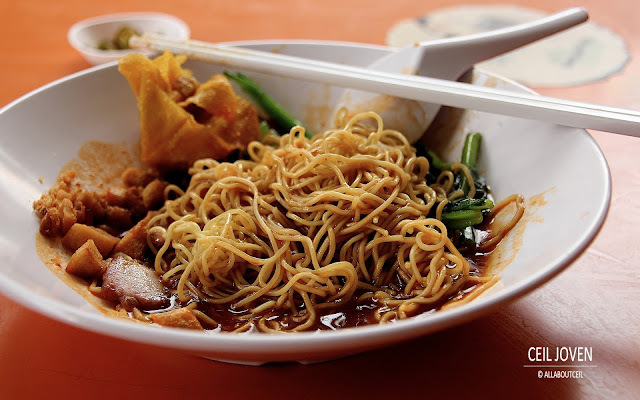 Mr Roy Chan is the creator of this wanton mee. He is a Chemist that spent a sufficient amount of time in researching and creating a plate of perfect wanton mee consists of the perfect noodle, perfect char siew and perfect wanton. And to find the best possible noodle, he has went through many different types of noodle to find the best fix for the perfect wanton mee. When he found the perfect matched, he went ahead to acquire a Japanese made noodle cooker to ensure that the noodle is cooked with a precise setting to ensure its consistency. The constant movement of the cold water pumping in to replace the cloudy water is the key to ensure the doneness of the noodle and its texture. The noodle is cooked at a particular temperature and timing by digital timer to make it possible. Next, the chilli has to be well-constructed to have a mixture of sweetness, spiciness and saltiness using 14 types of secret ingredients. And, to ensure the consistence of the texture and thickness of the sauce, he acquired a Salt Meter and Refractometer. The color of the chilli is a beautifully bright red and this color forms a red ring around the wanton mee when served it with the noodle. 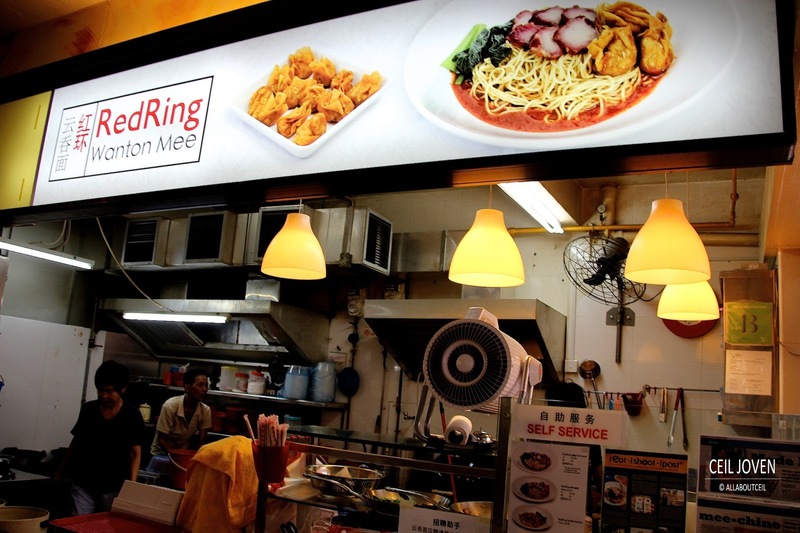 Apparently, this is how the stall derived at the name 'RedRing Wanton Mee'. There are the selection of spicy and non-spicy version using the same sauce mix but with or without the spiciness. However, the non-spicy is not mainly the tomato sauce version but painstakingly to create a special sauce base especially to give it the umami flavor. 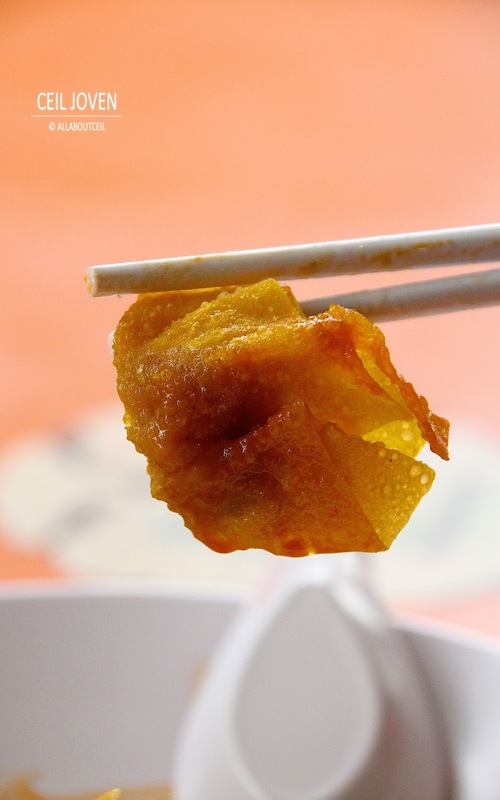 The part selected for their char siew is the armpit to ensure the texture of well-balanced juiciness and tenderness with an aromatic smokiness by the Web Smoker that they specially acquired for the purpose. A special mangrove charcoal imported from Malaysia selected to roast the char siew in the machine. A basic plate of wanton mee is at $2.50. There is a larger selection at $3.00 and an extra ingredients selection at $4.00. I just had lunch so i went for the smaller serving with spicy option. A handful of their well cooked eggy noodle was served with a few slices of their perfectly executed char siew with vegetable then topped with their freshly fried wantons. The precisely cooked noodle managed to achieve the desirable firmness and springiness. The freshly roasted char siew has not a bit of preservative or artificial coloring but using a precise recipe incorporating with the roaster to achieve its consistence taste and color. The level of spiciness is well-balanced with a slight tanginess. You are able to specify the level of spiciness from low to medium to high. The nicely fried pork lards are available for self-service right at the counter. This stall is currently manned by Mrs Esther Chan, the mother of the young man that went to pursue a Ph.D degree in Chemistry at Stanford University. This is definitely a plate of above average wanton mee. Though the portion given for $2.50 is a bit too little but their efforts in perfectly and precisely executing it is commendable.